Last week I started my guide of ‘great gifts for the holidays‘. This week I’m bringing you another book review, with what has turned out to be one of my favorite books in quite some time. A few weeks ago, I was contacted and offered an opportunity to get an early copy of 59 Illustrated National Parks, Celebrating 100 Years of Wilderness and Wonder. This book was written and illustrated by the dynamic father and son duo consisting of Joel and Nathan Anderson, and their team at Anderson Design Group. “The book features original poster illustrations, photography, facts and stories about our great American wilderness parks and the people who protect and preserve them.” It took Joel and Nathan five years to create these custom poster illustrations for each park. 59 Illustrated National Parks features 160 pages with 59 National Park illustrations, 12 oil paintings, historic photographs, a “Did you know?” and tips section for each park, a United States map, and an overview of the 100 year history of our incredible National Park Service. The book measures 9×12 and makes for the perfect gift and coffee table book. As you can see in the photograph above, each National Park is headlined with a beautiful illustration. Yosemite also has a beautiful oil paining. As a traveler with dreams of eventually visiting all 59 National Parks, it’s awesome to read the tips section of each park. For instance, the Yosemite entry tells you the best time to visit and the best place to take a photograph. It also offers nice tidbits in the “Do you know?” section. As much as I love Yosemite, I didn’t know that the Merced River ran for 81 miles through the park! Each National Park has great information like this, which makes it a great book to pick up and read all at once, or just in short sections. Putting together a few paragraphs on each National Park must have been a daunting task. As a blogger and aspiring writer, I hear Shakespeare in my head with “brevity is the soul of wit” every time I try to provide a concise and comprehensive write up of anything I do. The Andersons did a great job here, as each park has a bevy of entertaining facts, interesting back stories, and compelling narratives, that will keep you turning the pages for years to come. In 59 Illustrated National Parks, the parks are listed in order of the year they were established. This was a great history lesson all by itself! I also learned that 27 states have National Parks, with my home state of California leading the way with 9. These are the kinds of facts that stir my desire for exploration and wanderlust, as they make me realize how much there is still to explore just in my own country. As much as I love the history of the National Park Service and the 59 National Parks, the illustrations are what really make this book a ‘must buy’. The Andersons spent years “studying the rendering techniques, typography, color palettes, and style of the art done in the 1920’s, ’30s, and ’40s”, to give each illustration an authentic vintage look. Joel Anderson writes about his love of the Golden Age of Poster Art in a two page spread called “About the Art and the Artists” that I found absolutely fascinating. I really wish more artists and authors would do this, as it’s always a pleasure to take a short trip into the creative mind of an artist. 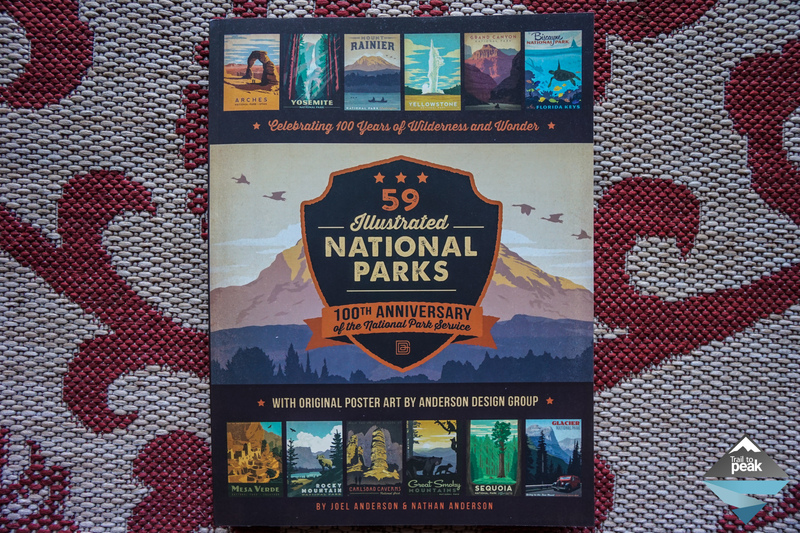 You can find 59 Illustrated National Parks at the Anderson Design Group Store. This book has been on pre-order, but those orders are set to start shipping on November 16, so place your order soon. You can also purchase each illustration in the form of a wall poster from the ADG website. These posters would also make incredible gifts, and I plan on picking up a few for my loved ones come the holidays. Along with the book, I also received a set of postcards depicting the 59 National Park illustrations. I’m not seeing these available on the ADG store website yet, but I’ll keep an eye out and post a link when they’re available. This would make for a great stocking stuffer, or a gift for yourself. Pick up your copy of 59 Illustrated National Parks in time for the holiday season. This book will make a great gift. Thanks! I agree, it’s the perfect gift for the avid hiker or backpacker! What a great book and gift idea… thanks!